How do we use topographic maps to find Gradient and Steep Slopes? Contour lines show us the change in elevation between points. If we find an area on the map where the elevation changes a lot in a very small space, that indicates a steep slope. 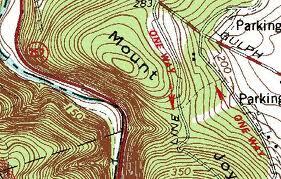 To find steep slopes we look for areas on the map where contour lines are close together. In contrast, areas where the contour lines are very spread out represent very flat, level surface with low slopes. Now that we can identify areas with steep slopes, the next thing we want to be able to do is measure exactly HOW steep it is. Now we use this information to calculate the gradient of the slope between A and B. the equation for gradient can be found on the cover of the ESRT. The higher the gradient value is, the steeper the slope is.